Kyle Charvat Foundation - Beneficiaries - Nick M.
Tumors were found in Nick’s abdominal cavity, a rare cancer that is diagnosed only 2,000 times per year or so. Because of the rarity, treatment for this cancer is done only in a couple places around the country. 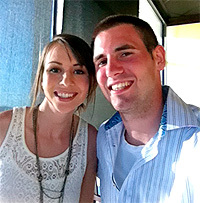 The Kyle Charvat Foundation provided funding to Nick and his wife, Alyssa, for travel and lodging during Nick’s initial treatment in Omaha, NE.